NEW YORK, NY--(Marketwire - January 31, 2011) - According to a new study by the National Institutes of Health, cancer treatment spending is expected to reach $158 billion by 2020. This represents an increase of 27% over 2010 which had been projected to hit $127.6 billion, with costs linked to breast cancer ($16.5 billion), colorectal cancer ($14 billion), lymphoma ($12 billion), lung cancer ($12 billion) and prostate cancer ($12 billion). 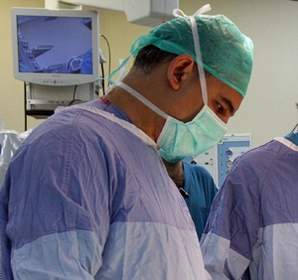 "The increase is due to expensive new diagnostic and treatment methods, which is not surprising," said Dr. David B. Samadi, a robotic surgery expert, as well as the Vice Chairman, Department of Urology, and Chief of Robotics and Minimally Invasive Surgery at The Mount Sinai Medical Center in New York City, "The field of prostate cancer screening, prostate cancer treatment and prostate surgery are constantly evolving and innovating, so understandably it made the list." "However, it's difficult to predict the future of healthcare costs based on cancer research, especially prostate cancer treatment and prevention because it's impossible to predict the future developments in the prostate cancer arena and their ultimate effect on these costs," said Dr. Samadi. The projections appear this week in the online Journal of the National Cancer Institute and are based on the most recent information on cancer incidence, survival and costs of care. Follow-up treatments could further increase expenditure to $207 billion. Researchers figured that cancer care costs will increase as new technologies and treatments are developed. "This is especially true with prostate cancer, although no new diagnostics have been developed; prostate cancer treatments have certainly undergone drastic changes, especially with regards to robotic surgery. The difference with a robotic prostatectomy is that although post operative diagnostics are needed, recovery of sexual function and continence are highly likely with no additional surgeries. I follow up with my patients after each robotic surgery to ensure that post operative quality of life is uncompromised with the cancer cure," said Dr. Samadi. According to previous estimates, there were 13.8 million cancer patients that survived in 2010. Fifty-eight of those patients were age 65 or older. The number of survivors in 2020 is expected to grow by 31% to about 18.1 million, with the largest group of cancer survivors to be among patients age 65 and older. Dr. Samadi is confident he will see this in his prostate cancer patients. "Thanks to frequent screenings, early detection and robotic surgery, there is no reason that a prostate cancer diagnosis should be a death sentence," said Samadi, who has performed over 3,100 successful robotic prostatectomies in his practice. "The rising costs of treating prostate cancer, and all cancers, show us how vital it is to continue to research the science behind cancer prevention and treatment to make sure that we're using the most effective approaches," said Dr. Samadi, "And with robotic surgery, I already know I'm using the most effective approach for my prostate cancer patients."